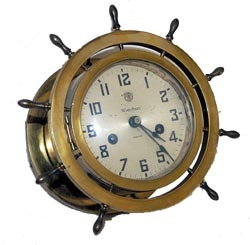 Waterbury Clock Co., "Ship's Bell No. 10", C. 1915. 8 day, half hour strike on a gong, jeweled movement is running, 4.5" silver dial, convex glass, diameter of wheel 8", measures across the back 6.25". Threaded hole on the bottom where it attached to a base originally. Side push button latch. Ly-Waterbury #2087.